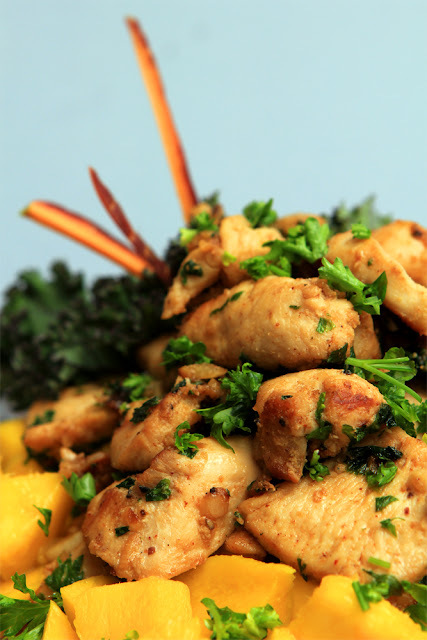 - Cut the chicken breasts into cubes or slices. - Peel the garlic, and chop it finely. - Put a bit of cooking oil in a pan. Add the chicken. Place the garlic on top of the chicken (we don't want it to cook yet). - Cook on medium heat until the chicken turns white. - Turn the heat to high, and stir (we want to start cooking the garlic as well). Add spices: salt, pepper, and chili pepper. - Cook on high heat until we get some spots of nice brownish color on the chicken pieces. - Remove the garlic chicken from the cooking pan. - Mix with the chopped parsley, and serve. - The recipe has a limited range of colors: the green of the parsley, and the white/brown of the chicken. Enlarge this range with different add-ons. For example, we placed the recipe on a bed of mango pieces, and we used strips of heirloom carrots to add accents of red and purple.